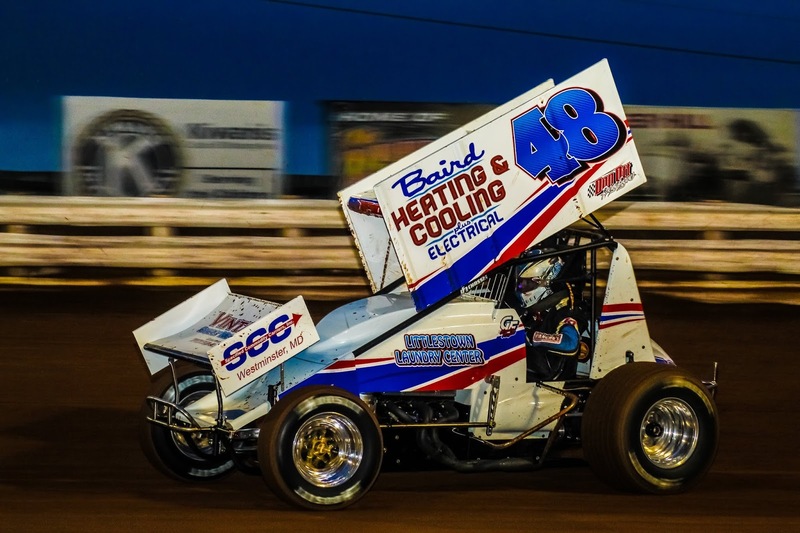 With the rescheduled “Insinger Performance Fuels Spring Championship” around the corner, several drivers and race teams took the time to fine tune their 358 Sprint Cars in preparation for the annual event, which, for the first time ever, will feature time trials. Glenndon Forsythe and car owner Andy Baird were one of those teams. “Winning at Trail-Way is great,” Forsythe exclaimed in victory lane, “I’m normally a (Williams) Grove guy, but my car owner talked me into racing at Trail-Way. I guess he was smart tonight!” Baird’s decision was ultimately a good one, as Forsythe’s only challenge was maneuvering around lapped traffic. As Forsythe was beginning to lap the field, a flipping Greg Plank brought out the red flag on lap 12. Plank was able to walk away under his own power after flipping his car in turns three and four. On the restart, Forsythe pulled away to a commanding lead over Cody Fletcher, Joe Trone, Jr., Dylan Norris and JB Cunningham. The final caution of the night went to Stewartstown’s Steve Kisamore, who spun in turn two, collecting Ashley Cappetta. Kisamore retired to the pits while Cappetta was able to rejoin the field after briefly exiting to the pit area. On the final restart, Forsythe was able to pull away from Fletcher to claim victory, crossing the line by a margin of 1.917 seconds. Fletcher finished the night in the runner-up spot followed by Trone, Jr., Norris and Chris Frank, who completed the top five. Starting 16th and finishing seventh, Mike Bittinger, took home the Big Mike’s Crabhouse Hard Charger award. During hot laps, Hanover’s Kody Hartlaub exited his sprint car on the backstretch and immediately dropped to the ground to put out a fire that was started by the fuel line coming undone. Hartlaub was taken to a nearby hospital where he was diagnosed with second degree burns on his legs. With Hartlaub unable to compete in the heat and feature, a call was placed to local driver and friend, Troy Wagaman. Troy, and girlfriend Nicole Signor, were having a date night in Gettysburg when the call was made, but the two decided to cut the date short and hightail it to Trail-Way. Due to the driver change, Wagaman tagged the rear of the feature and was able to finish tenth. Heat wins for the 20 358 Sprint Cars went to Frank, Cappetta, and Shane Hoff. Cory Myers went home $850 richer after claiming the 270 Micro Sprints “4th Annual Gary Kiefert Memorial,” Friday night at Trail-Way Speedway. Myers took the lead away from fifth-starting, Steven Cox, on the second lap and expertly navigated lapped traffic to earn his second consecutive 270 Micro victory at Trail-Way. This was not only Myers’ second consecutive 270 Micro win at Trail-Way, but also his second Gary Kiefert Memorial win. Cory and brother Chad claimed twin 20 victories during the inaugural event. Cox finished second followed by Donahue Motorsports Hard Charger, Brent Bull in third, Boer in fourth and Tim McClelland rounding out the top five. Additional sponsors for the Gary Kiefert Memorial race included the Kiefert family, Bel Air Soft Wash, Dixon’s Plumbing, Motorama Events, Brenda Cox, Mike Rutherford and Brian Marriott. Through these additional sponsors, an extra $1,300 was awarded to various finishers. Zachary Glass and Cox claimed heat wins and were awarded $50 each. Ryan Smith and Kyle Martin put on a show in the Precise Racing Products Street Stock 20-lap A-main, with Smith holding off Martin’s advances to take his first career Trail-Way Street Stock victory. Fourth-starting, Brian Walls, led the first two laps before stopping and bringing out the caution in turn four. Smith assumed the lead and was challenged by Will Walls for several laps before Walls was passed by Martin. Martin tried several times to make something happen but Smith held his line and was able to claim victory. Martin held on to finish second followed by Sam Gallagher, Will Walls and Marshall McMullen completing the top five. Gallagher picked up the win in the June 1 makeup race that was rescheduled due to a rainout. Gallagher led the entire race and was glad it turned out the way it did despite temperature problems. Jamie Zentmyer, Brian Walls, Danny Beard and Jim Jacobs completed the top five in the makeup feature. Robbie Carroll earned his second win of 2018 in the Limited Stocks 15-lap feature. Carroll passed racelong leader, Kyle Rohrbaugh, on the ninth lap and went on to claim the win. Rohrbaugh finished second followed by Terry Hartlaub, Jason Chronister and Travis Brown completing the top five. Heat winners for the Limited Stocks were Hartlaub and Brown. Trail-Way Speedway returns to action next week with the rescheduled Insinger Performance Fuels 358 Spring Championship which will feature time trials. Joining the Sprints will be the 600 Micros, Limited Stocks, Central PA Legends and Classic Cars. Gates open at 5:30 p.m. with heats scheduled to begin at 7:45 p.m. Feature (25 Laps) - 1. 48-Glenndon Forsythe, ; 2. 66A-Cody Fletcher, ; 3. 99-Joe Trone Jr, ; 4. 44-Dylan Norris, ; 5. 00-Chris Frank, ; 6. 77-David Holbrook, ; 7. 12-Mike Bittinger, ; 8. 39-Jason Cunningham Jr, ; 9. 19D-Wyatt Hinkle, ; 10. 11D-Kody Hartlaub, ; 11. 51-Austen Treuchet, ; 12. 89-Ashley Cappetta, ; 13. 77K-Steven Kisamore, ; 14. 69-Shane Hoff, ; 15. 2-Dennis Gross, ; 16. 11-Greg Plank, ; 17. 35C-Cody Phillips, ; 18. 10T-Brody Treaster, ; 19. 13A-Trevin Caruccio, ; 20. 511-John Sharpe, . No time. Heat 1 (10 Laps/All Qualify) - 1. 00-Chris Frank, ; 2. 66A-Cody Fletcher, ; 3. 39-Jason Cunningham Jr, ; 4. 77-David Holbrook, ; 5. 11-Greg Plank, ; 6. (DNF) 12-Mike Bittinger, ; (DNS) 11D-Kody Hartlaub. No time. Heat 2 (10 Laps/All Qualify) - 1. 89-Ashley Cappetta, ; 2. 99-Joe Trone Jr, ; 3. 511-John Sharpe, ; 4. 51-Austen Treuchet, ; 5. 10T-Brody Treaster, ; 6. (DNF) 35C-Cody Phillips, ; 7. (DNF) 13A-Trevin Caruccio, . No time. Feature (20 Laps) - 1. 20-Cory Myers, ; 2. 44-Steven Cox, ; 3. 1B-Brent Bull, ; 4. 22-Michael Boer, ; 5. 6-Tim Mc Clelland, ; 6. 21-Zachary Cool, ; 7. 1-Brian Marriott, ; 8. 16-Keera Dupler, ; 9. 03-Branstin Shue, ; 10. 09-John Horton, ; 11. 28-Matt Frick, ; 12. 47-Bobby Lamond, ; 13. (DNF) 03T-Troy Fickes, ; 14. (DNF) 84-Zachary Glass, ; 15. (DNF) 4T4-Joe Long Jr, ; 16. (DNF) 21X-Brady Gossert, ; 17. (DNF) 37-Tyler Brown, ; 18. (DNF) 12-Bryce Trone, ; 19. (DNF) 96-Brock Whisler, ; (DNS) 7-Brent Mowery. No time. Heat 2 (8 Laps/All Qualify) - 1. 44-Steven Cox, ; 2. 20-Cory Myers, ; 3. 1-Brian Marriott, ; 4. 6-Tim Mc Clelland, ; 5. 03-Branstin Shue, ; 6. 28-Matt Frick, ; 7. (DNF) 37-Tyler Brown, ; 8. (DNF) 09-John Horton, ; 9. (DNF) 7-Brent Mowery, ; 10. (DNF) 21X-Brady Gossert, . No time. June 1, 2018 Makeup Feature (20 Laps) - 1. 25-Sam Gallagher, ; 2. 81J-Jamie Zentmyer, ; 3. 2W-Brian Walls, ; 4. 60-Danny Beard, ; 5. 4J-Jim Jacobs, ; 6. 94-Dalton Myers, ; 7. (DNF) 28S-Kelly Seal, ; 8. (DNF) 21W-Will Walls, ; 9. (DNF) 54-Kyle Martin, ; 10. (DNF) 60A-Aaron Beard, ; 11. (DNF) 35-Ryan Smith, ; 12. (DNF) 39-Wayne Dutterer Jr, . No time. Feature (20 Laps) - 1. 35-Ryan Smith, ; 2. 54-Kyle Martin, ; 3. 25-Sam Gallagher, ; 4. 21W-Will Walls, ; 5. 75-Marshall McMullen, ; 6. 60A-Aaron Beard, ; 7. 60-Danny Beard, ; 8. 4J-Jim Jacobs, ; 9. 94-Dalton Myers, ; 10. (DNF) 28S-Kelly Seal, ; 11. (DNF) 37-Mark Hutchinson, ; 12. (DNF) 2W-Brian Walls, ; (DNS) 54J-Jimmy Combs, ; (DNS) 81J-Jamie Zentmyer, ; (DNS) 69-Tyler Harman, ; (DNS) 94M-Zachary Myers. No time. Heat 1 (8 Laps/All Qualify) - 1. 21W-Will Walls, ; 2. 25-Sam Gallagher, ; 3. 2W-Brian Walls, ; 4. 75-Marshall McMullen, ; 5. 35-Ryan Smith, ; 6. 54-Kyle Martin, ; 7. (DNF) 69-Tyler Harman, ; 8. (DNF) 37-Mark Hutchinson, . No time. Heat 2 (8 Laps/All Qualify) - 1. 54J-Jimmy Combs, ; 2. 94-Dalton Myers, ; 3. 28S-Kelly Seal, ; 4. (DNF) 4J-Jim Jacobs, ; 5. (DNF) 81J-Jamie Zentmyer, ; 6. (DNF) 60-Danny Beard, ; 7. (DNF) 60A-Aaron Beard, ; 8. (DNF) 94M-Zachary Myers, . No time. Feature (15 Laps) - 1. 69-Robbie Carroll, ; 2. 12-Kyle Rohrbaugh, ; 3. 92-Terry Hartlaub, ; 4. 38-Jason Chronister, ; 5. 47-Travis Brown, ; 6. 2X-Shannon Weaver, ; 7. 88-Justin Oberlin, ; 8. 77-Justin Mong, ; 9. 4-Dalton Minovich, ; 10. 29-Wayne Kopp, ; 11. 6-Matt Worley, ; 12. 46-Donald Smith, ; 13. 67C-Jason Minter, ; 14. (DNF) 99-Cody Klinedinst, ; 15. (DNF) 21-Ricky Weaver Jr, ; 16. (DNF) 16-Julio Perez, ; 17. (DNF) 56-Zach Baxter, ; 18. (DNF) 36-Bobby Wellman, ; (DNS) 13-Zach Rock. No time. Heat 1 (6 Laps/All Qualify) - 1. 92-Terry Hartlaub, ; 2. 38-Jason Chronister, ; 3. 12-Kyle Rohrbaugh, ; 4. 77-Justin Mong, ; 5. 2X-Shannon Weaver, ; 6. 6-Matt Worley, ; 7. 4-Dalton Minovich, ; 8. 46-Donald Smith, ; 9. 29-Wayne Kopp, ; 10. 36-Bobby Wellman, . No time. Heat 2 (6 Laps/All Qualify) - 1. 47-Travis Brown, ; 2. 69-Robbie Carroll, ; 3. 16-Julio Perez, ; 4. 99-Cody Klinedinst, ; 5. 21-Ricky Weaver Jr, ; 6. 56-Zach Baxter, ; 7. 67C-Jason Minter, ; 8. (DNF) 88-Justin Oberlin, ; 9. (DNF) 13-Zach Rock, . No time.